You're ready to take on the day in the Keds x kate spade new york® Ace Lips/Hearts sneakers. 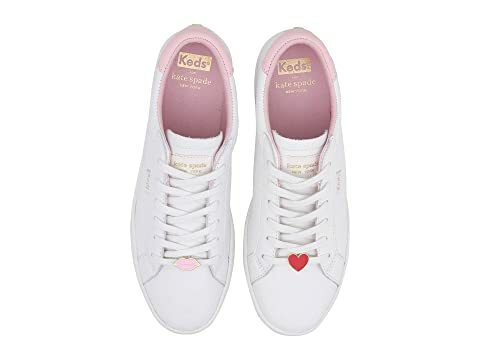 We can't currently find any similar items for the Ace Lips/Hearts by Keds x kate spade new york. Sorry! I have wide feet & they fit great. I love how stylish and simple they are. Overall: Rated: 3 stars! Comfort: Rated:2 stars! Style: Rated:4 stars! I feel like I could make these work with long, cushioned socks and pants - but the whole point of white/pink low rider sneakers (for me) is to wear no show socks. I have had shoes that feel comfortable WITHOUT socks. But the tongue on these is SO long that it digs into the front of my ankle every step I take. Really disappointed too because I like the look a lot and the little gems on the shoes just make them! Still, I wear sneakers instead of heels for a reason: COMFORT. I have several KEDS/Kate Spades but they're all "Champion" style, so if you're having the same issue as me just try some Champs before you leave Keds.